Over the past few months, I’ve published two series of guest posts from teachers of English Language Learners: one on teaching math, and the other on ELLs and Special Needs. I recently put out a call for guests posts from ELL teachers of science, and this piece from Elana Rabinowitz is the first of many…. Elana Rabinowitz is an ESL Teacher and Freelance writer working in Brooklyn, NY. She is currently at a middle school where she is the ESL Coordinator and teaches 6, 7 and 8th grade ELLs. She has worked for the Department of Education for over 16 years. Follow her on twitter. When my principal assigned me to push into an 8th grade science class, I began to panic. I was an ESL teacher – used to pushing into classes, but the rigor and depth of middle school life science was much more than I bargained for. At first, I thought we’d mix like oil and water. The thing about science, though, is that kids like it. A lot. It’s interesting, involves numerous hands on activities and they often have a lot of questions. The problem is getting them to retain all this new information and apply it. For my ELL’s, vocabulary was always the biggest obstacle. I had science glossaries in each students’ languages printed out, but they often gathered dust and were rarely used. I found creating personalized vocabulary sheets for each unit helped tremendously. 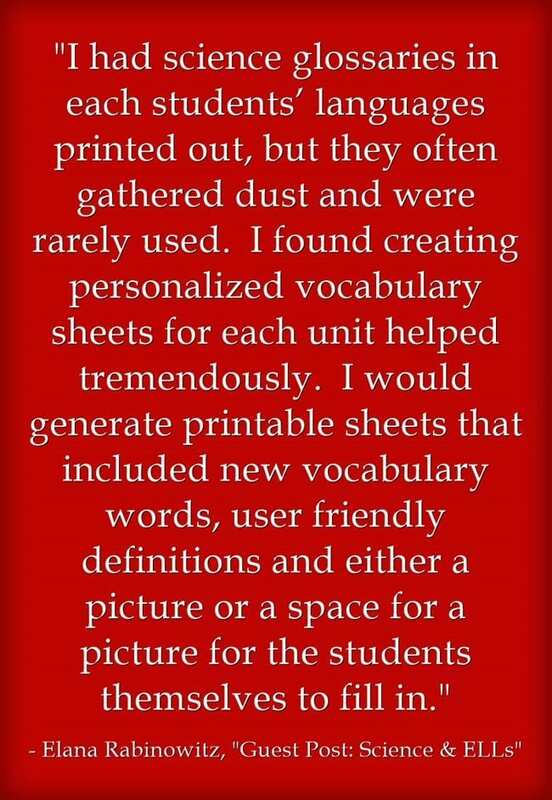 I would generate printable sheets that included new vocabulary words, user friendly definitions and either a picture or a space for a picture for the students themselves to fill in. They would place them in their science notebooks and were able to refer to them throughout the year. I was placed in an ICT classroom (ICT is Integrated Co-Teaching – 2 teachers in a classroom consisting of kids with IEP’s and general education students) and was able to negotiate a table in the corner where I could work with my ELLs in a small group. Often, they were reluctant to speak up in class, but if they whispered the answer to me and I nodded it would then give them the confidence to participate more in class helping them improve their speaking skills. I would always ask them “why” they think that – ensuring they would elaborate their responses. The current textbooks and materials are not well suited for English Language Learners. Together, the science teacher and I created differentiated handouts based on the student’s individualized needs. For my ELLs (as well as some of the children with IEP’s) we would often put graphics and some models of how to answer each question. Depending on the level, we included appropriate sentence starters and a word bank to assist them in their writing. We often incorporated short videos to aid in explaining a new topic and were able to have laptops available for students to take individual exams to help them self-evaluate. We liked Quizlet and Edpuzzles, but there are many other options. The kids loved when we gave them “clickers” that they could use to answer questions anonymously. In the 8th grade, students are given a Statewide cumulative test at the end of the year. As with all tests, ELLs are entitled to time and a half and they definitely needed the extra time. Archived exams are available online and we used them to practice. I had them first work with partners to guess the correct answers then explain either verbally or write down why they chose each answer. I’m happy to report that all my ELLs passed the exam and also received some of the highest grades in the class. I had previously been intimidated to co-teach science, but I am going to try again this year. It’s such an important link in learning, especially because many of the NYSELAT passages are related to science questions. When I see my students in small groups I often give them listening activities based on information they have or will learn in their science class to help them gain and reinforce prior knowledge. We gave a lot of collaborative work in our class and when it came to presentations we often mixed the ELLs with mainstream students and this has worked well. We provided checklists and rubrics to clarify the expectations of assignments. Since the exam is an accumulation of three years of curriculum, extra steps need to be taken to expose ELLs to materials they may have missed by studying elsewhere. Teaching science is much like learning it, it is trial and error, some ideas are explosive, and others fall flat, but there are so many wonderful labs and pre-made materials (think Pinterest or Teachers Pay Teachers) to help keep your students engaged all year. And finally, don’t be afraid to use humor in your class. Kids love the science jokes, and teachers – well, I am – working on that.